1Chongqing Infectious Disease Medical Center, Chongqing, PR China. 2Chongqing Pulmonary Hospital, Chongqing, PR China. The emergence of multi-drug resistant-Mycobacterium tuberculosis (MDR-TB), especially the Rifampicin-dependent (R-) MDR-TB, has become a hot issue. To elucidate the potential mechanism that rifampicin-dependent MDR-TB (latent infection) utilizes for its long-term survival, we studied the morphology and L-form growth pattern of rifampicin-dependent MDR-TB. Rifampicin-dependent MDR-TB was isolated from fresh sputum of patients and showed favorable growth in the Rifampicin-containing conditions. Conversely, when R-MDR-TB was cultured in Rifampicin-depleted medium, bacterial growth ceased and MDR-TB transformed into L-form cells. This transformation process was studied over a span of three weeks by both optical microscope and transmission electron microscopy (TEM). At week one, the R-dependent bacteria cultured under rifampicin-null conditions exhibited acid-fast positive fried egg colonies and mycoplasma cell-like morphology. During week 2, the exhibited morphologies of the R-dependent MDR-TB were: acid-fast positive filamentous, granular sphere, cell membrane sugar-coat (filamentous particles aggregations) and protoplasms with various sizes and shapes. The morphologies of R-MDR-TB at week 3 were: tiny translucent colonies and giant sphere, filaments, protoplasm, fried egg colonies and "mycoplasma (filopodia)". These morphologies are typical and representative characteristics of L-form cells growth. These findings reveal the L-form growth of rifampicin-dependent MDR-TB for the first time, and elucidate the potential mechanism of rifampicin-dependent MDR-TB longterm survival (latent infection). This data will help to provide a foundation for novel early diagnosis and effective treatment of R- MDR-TB. L-phase bacteria, Rifampicindependent cell-wall deficiency, Reproductive mode, Resting spores. Multi-drug resistant-Mycobacterium tuberculosis (MDR-TB) has become the major infectious bacterial strain of tuberculosis. Studies showed that R-dependent MDR-TB bacteria proliferates (virulence enhanced) in favorable rifampicin concentrations, but grows slowly (or transforms into L-form) in un-favorable rifampicin concentration conditions . As the result, TB patients infected with R-dependent strains will have worse outcome if treated with rifampicin or stronger rifampicin regimens. If these patients are treated with drug regimens without rifampicin, their conditions will improve . This rifampicin-dependence phenomenon is also verified by mouse models [3,4]. Recent data from Chinese TB specialist hospitals and agencies showed that R-dependent strains accounted for 36.7% (258/703 strains/year) and 39.1% (18/46) of TB cases in Chongqing and Beijing, respectively [3,5]. The hard-to-cure MDR-TB may due to the emergence of L-form bacteria. L-form bacteria, also known as: L-phase bacteria, L-phase variants, and cell wall-deficient (CWD) bacteria, are strains of bacteria that lack cell walls . The L-form of bacteria may grow and reproduce without a cell wall, thus they are proposed to be important in the acquisition of bacterial antibiotic resistance genes and the cause of latent TB infection. Our previous studies showed that when classical R-dependent TB is cultured without rifampicin, the bacteria showed characteristics of L-form transformation . In our current investigation, we observe, study, and confirm for the first time that R-dependent MTB can form L-phase bacteria. This might be the fundamental reason for R-MDR-MTB latent infection. Moreover, the study of TB L-form growth mode will benefit investigations of other pathogenic bacteria transforming into L-form. Sputum Source- Fresh specimens were collected from clinically diagnosed tuberculosis patients in Chongqing Pulmonary Hospital. Male, 70 years old, clinical diagnosis of the left upper right lower secondary pulmonary tuberculosis smear positive (+) with retreatment duration for 40+ years; Type II diabetes (duration 15+ years). This isolated strain was tested for acid fast stain. L-J clinical absolute concentration method was used to test rifampicin persistency and morphology .Many times results showed multi-drug resistant to isoniazid, rifampicin and streptomycin etc. The results also showed R-dependent growth thus determined as R-dependent MDR-TB. The rpoB gene was analyzed and results showed Ser-Leu mutation at rpoB 531 loci . The study protocol and instruments were approved by the Chongqing Infectious Disease Medical Center and the Pulmonary Hospital Ethics Committees. The participants provided their verbal informed consent; written consent was not obtained, as informed verbal consent was deemed adequate. The consent of the patients was documented as part of their medical report. The committees approved the consent. Bacterial culture method- BACTEC - TB460 12B culture and strain identification system (U.S. BD Company). Lowenstein Jensen (LJ) culture, sensitivity and strain identification were performed according to "tuberculosis bacteriology testing procedures" . R-Strain screening- L-J clinical screening was used to test rifampicin persistency and morphology. Dynamic analysis of experimental samples- Typical "rifampicin-dependent MDR-TB" fresh sputum was isolated from patients, with 12B liquid culture-positive bacteria identified by acid-fast staining, and suspended bacteria was inoculated in parallel in 0.1ml LJ R0 and LJ R250 for 10 tubes each, 370C culture. Weekly colony growth was evaluated by a patented in situ imprint device to avoid damage to the original structure of cell wall (Patent #201420676756.3). The morphology and structure features of bacterial culture tubes was analyzed and confirmed via electron microscopy. In parallel, the presence of Mycobacterium tuberculosis was confirmed by IS 6110 PCR. The Mycobacterium tuberculosis IS 6110 PCR analysis was done by Shanghai Wang Jin using biological Limited commercial kits. For the acid-fast staining, the entire slide was covered using the dye, with the coldcycling step done for 10 minutes or more. To prevent contamination, washing and bleaching process was used to avoid waterstained direct impact area of samples. Slides were then air-dried at room temperature. Optical microscopy analysis- Low magnification was used to observe the bulky form of bacteria. To obtain detailed morphology, we used high-power microscope positioning and oil immersion lenses. We also compared observations of L-J R0 and L-J R250 tube bacterial morphology differences. TEM Analysis- The second Military Medical University, Department of Cell Biology, provided JEM-2000EX transmission electron microscope analysis services. Comparative structural analysis is based on the special form of bacteria found in optical microscopy. Sputum from the patient remained positive for mycobacteria even at 250 μg/ml rifampicin, indicating a phenomenon of rifampicin-dependent MDR-TB. Strain characteristics results are summarized in Figure 1. The bacteria from the sputum of the patient exhibited favorable growth in Rifampicin-containing conditions, but growth became arrested and bacteria transformed into L-form morphology when in Rifampin-depleted conditions. Figure 1: Characteristics of clinically isolated R-dependent bacteria. (A) L-J culture colony morphology: R-containing tube colonies (left) showed rough, raised, cauliflower-like; R-depleted tube colonies (right) are small, flat, egg-like, L-type morphology. (B) Acid-fast staining (100X magnification): R-containing tube colonies (left) showed thick, dark chromatin staining particles obviously, typical morphology; R-depleted tube (right) are small cell chromatin shallow, stained particles is not obvious or missing; do not form typical morphology. (C) TEM morphology: R-containing tube colonies (left) shows clear cell structure, cell wall integrity, smooth edges; R-depleted tube colonies (right) showed fuzzy cell structure, dense condensation nucleus and cytoplasm, and cell wall defects. To further study the dynamic bacterial L-morphological process and its growth, the rifampicin-dependent MTB was cultured in R-depleted medium for three weeks. A time-course in situ tablet sampling method was used to sample the bacteria culture. The characteristics of bacteria were analyzed by transmission electron microscopy analysis (TEM) and assisted by acid-fast staining and microscopy. To confirm the bacterial strain is MTB, a MTB IS 6110 PCR analysis was also performed and this result is shown as well. Results were described in Figures 2-4. Figure 2: Acid-fast staining and PCR analysis. (A) One week of bacteria cultured in R-depleted tube showed acid-positive egg-like colonies (100X magnification); (B) MTB IS 6110 PCR analysis confirmed the bacteria in R-depleted culture are MTB. As shown, lane 1 is negative control, lane 2 is R-containing tube bacteria, lane 3 is R-depleted tube bacteria and lane 4 is positive control. Figure 3: Acid-fast staining and TEM analysis of week-two R-depleted culture. (A) Microscope observation (100X magnification) of acid-fast staining positive filaments after two-weeks of bacteria culture in R-depleted condition. (B) Huge acid-fast positive granules. (C) Acid-fast staining positive huge filamentous groups. (D) TEM analysis showed filamentous morphology. (E) Cross-section of filaments. (F) TEM analysis revealed the endospore morphology of bacteria. Figure 4: TEM analysis and acid-fast staining of week-three R-depleted culture. (A) and (B) TEM analysis of giant spherical granules with sugar coating (B), indicating maturation of bacteria. (C) The giant granules are proven to be acid-fast staining positive Mycobacterium tuberculosis (MTB). Briefy, acid-fast positive fried egg colonies emerged during week 1, indicating the characterization of MTB. At week 2, acidfast positive filamentous group, granular sphere, and protoplasm bodies with various sizes and shapes emerged, indicating the growth of L-form bacteria. At the final week, week 3, smooth translucent colonies, giant sphere and “mycoplasma (filopodia)” were observed. TEM analysis also revealed the sugar-coating. All of these observations indicate that the MTB has matured into L-form bacteria over the 3 week period and thus underwent a new cycle of reproduction. The growth mode of R-dependent MTB in the R-depleted environment is summarized in Figure 5. 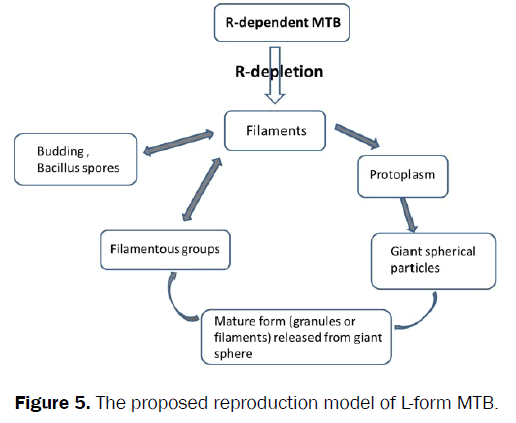 Figure 5: The proposed reproduction model of L-form MTB. In current study, we isolated rifampicin-dependent MDR-TB directly from a TB patient, cultured the bacteria in vitro, and studied its morphology and reproductive mode. For the first time, we clearly observed the rifampicin-dependent MDR-TB isolated from the patent transform into an L-form during 3 weeks when cultured without rifampicin. Bacterial L-form conversion, i.e. existence without rigid walls is a phenomenon universally recognized, but difficult to observe in nature [11,12]. Although the L-forms of various bacteria have been observed in the specimens of patients for many decades, most are ignored and generally regarded as staining artifacts or debris, until recently. We recognized and describe here a unique reproducing form of MDR-TB [13-15]. A variety of papers first reported mycobacterial L-form transformation in vitro, using factors such as antibiotics, acids, peptidoglycans etc to induce the change [16,17]. Our study is the first time L-form transformation was observed in samples and cultures taken from a R-dependent MDR-TB patient. In this study, microscopy analysis together with acid-fast characteristics of mycobacteria determined the existence of L-form bacteria. In addition, the electron density in TEM is associated with the levels of protein and RNA content of the bacterial nucleoid i.e. nuclear mass, also indicating that the electron density is associated with the degree of maturity of bacteria. Based on all the findings, we summarize the growth mode of L-form MTB as follows and in Figure 5. When rifampicin-dependent MDR-TB are cultured in the absence of rifampicin, (not suitable for their growth), cell wall synthesis stops. In one aspect, the protoplasm (colorless cytoplasm) proliferates, thereby enabling cell expansion, which then gathers together as a giant sphere (DNA replication or independent sphere). The protoplast unit further synthesizes genes and proteins that assemble into a complete L-particle (cell) and form giant spherical particles. Finally, the mature form (granules or filaments) is released from the giant sphere and begins a new breeding cycle. In another aspect, with cell wall synthesis stopped, cells can also be split in two single cells or directly in situ reproduction. This forms big mycoplasma and filamentous groups, allowing for budding or forming endogenous Bacillus spores or free buds. These findings suggest that, regardless of protoplasm reproduction or binary fission reproduction, rifampicin-dependent MDR-TB L-type cells are capable of reproduction. The growth mode of L-form variants shows some similarities to the mode of yeast budding, or the mode of virus selfreplication and release. In 1996, DeMaio et al cloned a Sigma factor gene . This gene encoded for a protein similar to that of blue silk bacteria and Bacillus subtilis spores form factor (SigF), along with a Bacillus subtilis stress response factor (SigB). The mRNA of Sigma factor gene was highly expressed in cultured bovine tuberculosis depletion of nitrogen or cold shock, but not in the logarithmic phase . These data suggests that the expression of SigF in MDR-TB may help to prepare and adapt the bacteria for host defense reactions or resistance. In our study, we found that M. tuberculosis L-form can form endospores (resting spores). Endospore is a unique form resistance that may be formed by Gram-positive bacteria under certain conditions . Our study clearly observes that endospores were formed in that M. tuberculosis culture. These findings highlight the dilemma of R-dependent MTB treatment. On one hand, the disease will worsen if patients infected by R-dependent MTB were treated with rifampicin regimens. On the other hand, if the patients were treated with no rifampicin regimens the L-form will start to grow and lead to latent infection. This hypothesis is verified by the outcome of our rifampicin-dependent TB patient that this patient never fully recovered from this disease. As another verification of out hypothesis, we also further demonstrated by the observations that L-form bacteria (acid-fast staining positive giant sphere) in other patients sputum samples. That MDR-MTB bacteria transform into L-form might be a fundamental reason why MDR-MTB is difficult to completely eliminate and cure. In summary, our findings shed light on the underlying mechanism of latent TB infection and long-term survival. Our findings may also be applied to develop strategies that control MDR-TB growth in the L-form variant. We thank Dr. Zhongyi Hu, from Shanghai Key Laboratory of Tuberculosis for support. Jialing Bao and Min Zhong wrote the main text of the manuscript, Min Zhong, Xiyan Zhang and Yiwei Wang performed the experiments, Jialing Bao and Min Zhong analyzed the data and prepared figures 1-5. All authors reviewed the manuscript. Zhong M, et al. Experimental observation of rifampicin-dependent tuberculosis. ZhonghuaJie He He Hu Xi ZaZhi. 2000; 23: 104-105. Zhong M, et al. An interesting case of rifampicin-dependent/-enhanced multidrug-resistant tuberculosis. Int J Tuberc Lung Dis. 2010; 14: 40-44. Jin H, et al. Preliminary research of rifampicin-dependent tuberculosis. Chinese Journal of Antituberculosis. 2012; 34: 670-675. Dong M, et al. Mouse model of rifampicin-dependent TB. Journal of Chinese PLA Postgraduate Medical School. 2011; 32: 982-983,989. Li T, et al. Discussion of application of clinical screened mycobacterial synchronization. Chinese Journal of Antituberculosis. 2013; 35:439-442. Zhong M, et al. Clinical analysis of 43 cases of rifampicin-dependent tuberculosis. Chinese Journal of Antituberculosis. 2003; 25: 104-106. Zhong M, et al. Growth of rifampin-dependent Mycobacterium tuberculosis in conditions without rifampin. ZhonghuaJie He He Hu Xi ZaZhi. 2002; 25: 588-590. Chinese Antituberculosis Association. TB diagnostic bacteriology testing procedures. Chinese Journal of Tuberculosis. 1996; 18: 28-31. Zhong M, et al. Chinese Journal of Laboratory Medicine. 2003; 26: 42-45. TB diagnostic bacteriology testing protocol. Chinese Journal of Antituberculosis. 1996; 18: 28-31. Xie H, Yang G, Lin S, et al. Modern Tuberculosis. (People's Health Publishing House, Beijing. 2000). Mattman, L, et al. L-variation in mycobacteria. American Review of Respiratory Diseases. 2006; 82: 202-211. Nadya Markova. Cell Wall Deficiency in Mycobacteria: Latency and Persistence, Understanding Tuberculosis - Deciphering the Secret Life of the Bacilli. [Dr. Pere-Joan Cardona (Ed.)] (InTech. 2012). Beran V, et al. Cell wall deficient forms of mycobacteria: a review. Vet Med. 2006; 51:365-389. Hines M and Styer E. Preliminary characterization of chemically generated Mycobacterium aviumsubsp. paratuberculosis cell wall deficient forms (Spheroplasts). Vet Microbiol. 2003; 24: 247-258. Naser S, et al. Low temperature protocol for efficient transformation of Mycobacterium smegmatisspheroplasts. Current Microbiology. 1993; 27:153-156. DeMaio J, et al. A stationary phase stress-response sigma factor from Mycobacterium tuberculosis. ProcNatlAcad Sci. 1996; 93: 2790-2794. DeMaio J, et al. Mycobacterium tuberculosis sigF is part of a gene cluster with similarities to the Bacillus subtilissigF and sigB operons. Tuber Lung Dis. 1997; 78: 3-12. Prescott LM, et al. Microbiology (5thedn.) (2001).